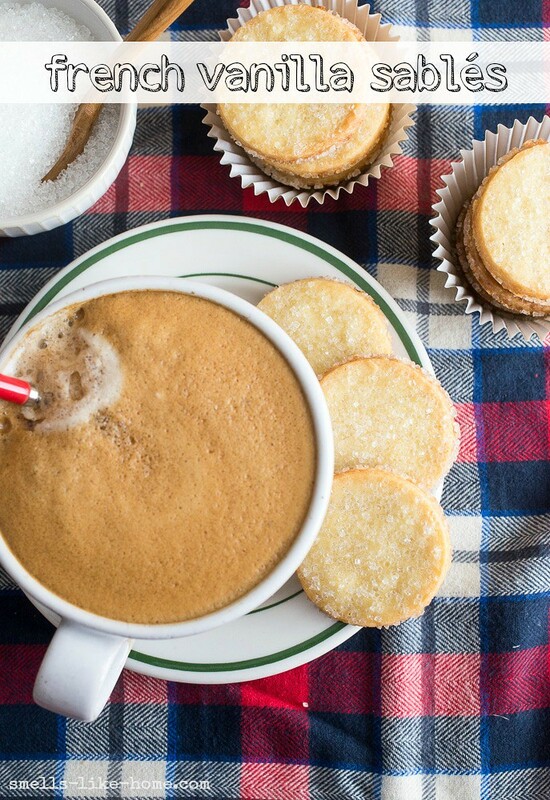 In spite of their fancy name, these French vanilla sablés are simple butter cookies like from the blue tin except in homemade form. They’re rich, delicate, and covered in sparkling sugar. snow makes me extraordinarily happy. 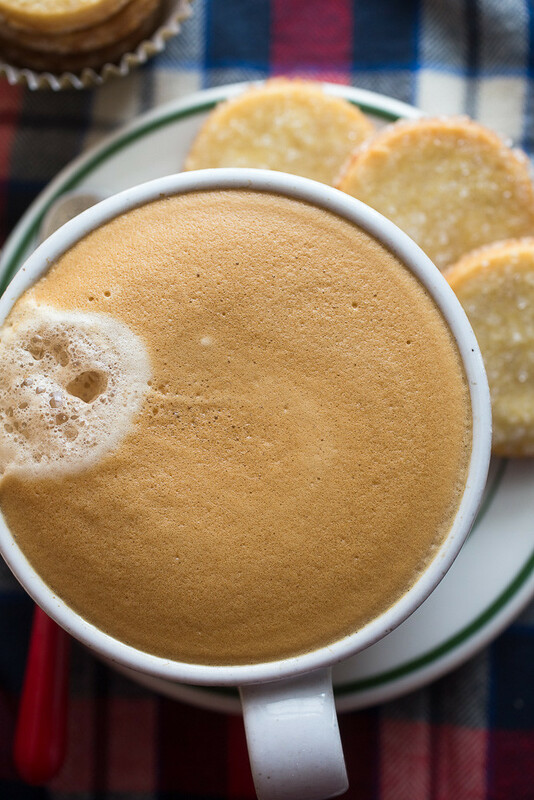 hot coffee makes me weak in the knees. a full, clean dishwasher makes me run from the kitchen. and any cookie by Dorie Greenspan that has the slightest hint of a butter or shortbread cookie in its description will be amazing. In all seriousness though and despite their fancy name, these French vanilla sablés are simple butter cookies like from the blue tin we’re all familiar with except in homemade form which, my brother so kindly also concluded on Christmas Day, that they were so much better than; a conclusion he came to quickly after my blank, darts-from-my-eyes stare at him. They’re rich, delicate, and covered in sparkling sugar. I made a double batch of the dough in early December, froze most of the cutout rounds in zip-top bags, and baked them off whenever I needed cookies for platters, guests, or for no reason other than for needing a couple cookies for myself. And they couldn’t be any easier to make. These French vanilla sablés are a simple cookie dough of butter, flour, sugar, salt, vanilla, and egg yolks. Just like the espresso dark chocolate sablés I shared last month, this dough is rolled out, chilled, stamped into rounds, and baked in a muffin tin. The kicker here is that you’ll sprinkle the tops with coarse sugar before baking. Those rosemary butter cookies I made years ago were formed into a log, brushed with egg white, and then rolled in sugar and while the rosemary cookies are delish, it’s a complete mess to make them. 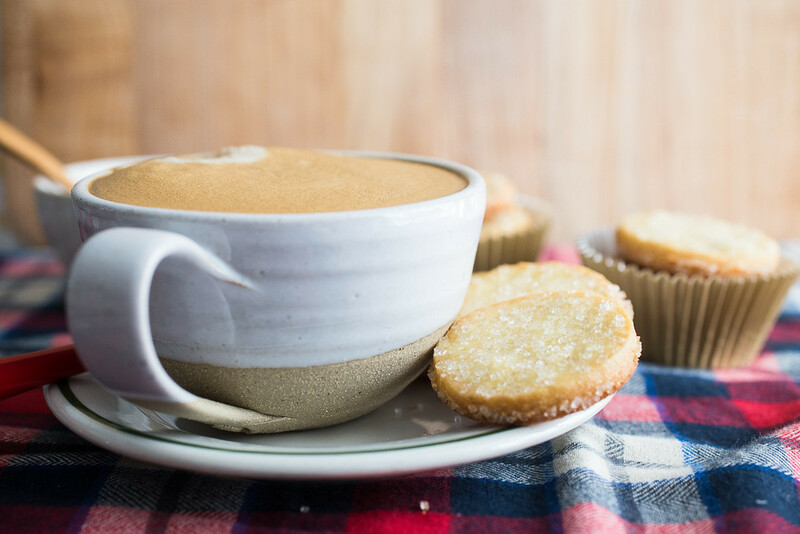 These French vanilla sablés are neat, tidy, and quick – and the perfectly round edges end up with crackly sugar too! For cookies of such sensational results, could you really ask for more? Beat the butter, sugars, and salt together in the bowl of a stand mixer fitted with the paddle attachment on medium speed for 3 minutes until smooth (not fluffy), scraping down the sides and bottom of the bowl once per minute. Reduce the speed to low and beat in the yolks one by one and then then mix in the vanilla extract. With the mixer off, add all of the flour; stir on low until the flour just about disappears into the batter. Remove the paddle and bowl from the mixer and scrape down the sides and bottom of the bowl again and give the batter a couple of quick stirs to incorporate the left-behinds. Transfer the dough to a clean work surface, divide it in half, and gather each piece up into a ball and flatten into a disc. Place one of the discs between two baking-sheet size pieces of parchment paper; roll out the dough to ¼-inch thickness. To prevent the parchment from sliding all over the place, it helps if you mash a little piece of the dough between the bottom piece and the counter. Slide the dough still sandwiched between the parchment on to a large baking sheet, repeat the process with the second piece of dough, and chill for at least 2 hours or freeze for 1 hour. When ready to bake, preheat the oven to 350° F and have two 12-well nonstick muffin tins ready to go (if not using nonstick, grease the wells). Using a 2-inch round cookie cutter, cut out rounds from the cold/frozen dough and drop the rounds into each of the wells of the tins. Gather up the scraps, reroll, rechill/freeze, and repeat with the dough remnants and the second piece of dough. Right before baking, cover the tops of the dough with the sanding/coarse sugar. Bake for 10 minutes in the center of the oven, rotate the pans, and bake for another 5 to 6 minutes, just until the edges are slightly browned. Allow the tins to cool for 10 minutes on wire racks before transferring the cookies to the racks to cool completely. 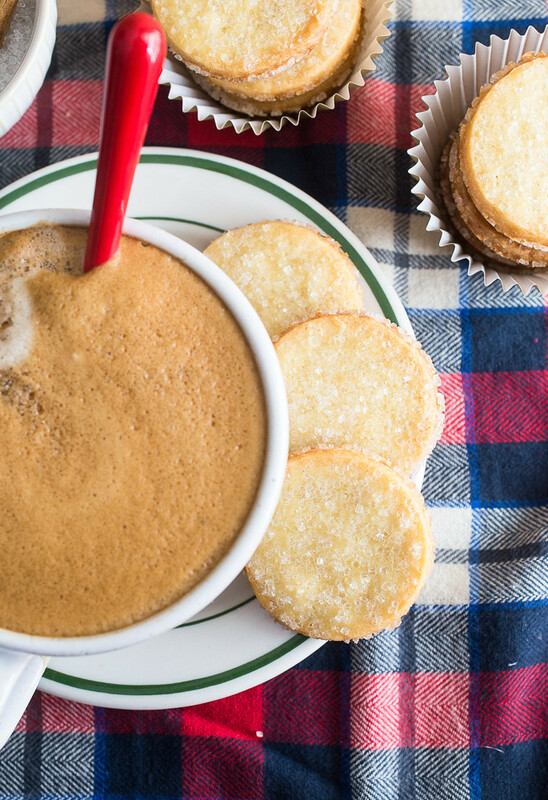 The beauty of these French vanilla sablés is in the prep. Instead of rolling the dough into a log for a slice-and-bake cookie, this dough is rolled out flat between 2 pieces of parchment paper, chilled, and then cut with a cookie cutter. This makes for a MUCH simpler and less messy cookie, and the chill time is reduce by about half. Win-win-win! Beautiful Tara! I just bought her cookbook, because who doesn’t need more cookies in their life? I need to make these asap. these pics are stunning and make me feel so cozy!! These cookies look buttery and crisp and perfect! Thanks, Kayle! These cookies are so lovely. They did make want to snuggle under a blanket but they can go fancy at the same time. Sparkling sugar just does that to a cookie, doesn’t it? What temperature should these be baked at please? Thank you! So sorry about that! Bake at 350 degrees F. I just updated the recipe.